These DB25 right angle connectors are designed to be mounted on printed circuit boards. 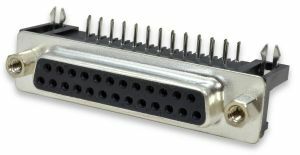 All 25 pins and two mounting tabs (locking forks) extend through the circuit board, providing a convenient and sturdy connection. These connectors are the 0.318" set back style. This means that the distance between the connector face and the closer row of pins is 0.318". See the drawing below.